An illustrator and sometimes writer of children's books, Evaline Ness seems to have lived a colorful, interesting and possibly tempestuous life. Her work in the 1950s and especially the 60s was recognized for its formal strength and embrace of diverse printerly media. Born Evaline Michelow in Union City, Ohio, (then and now a tiny town on the Indiana border) she studied at Ball State Teacher’s College, followed by the Chicago Art Institute–consecutively in pursuit of a career as a librarian and a fashion illustrator. Ness took (and retained) the name of her second husband, Eliot Ness, the former treasury agent who led "the Untouchables" and bedeviled Al Capone. Ness, a divorcee, landed as the safety director in Cleveland, Ohio in the late 30s where he struck up a relationship with the "alluring" (contends Capone biographer Laurence Bergreen) Evaline, herself recently free of husband No. 1, a Mr. McAndrew. Evaline worked as a fashion illustrator at Higbee's Department store (known to devotees of A Christmas Story, the movie, and well-remembered by me as the local fancy department store as a kid in northeast Ohio.) The pair married secretly in 1938-39, and moved on to Washington DC several years later when things soured for Eliot in Cleveland. The marriage did not last. Evaline migrated to New York, where she worked for Saks Fifth Avenue. She studied intermittently: at the Corcoran School of Art in Washington, the Art Student’s League in New York City, and–on a European interlude until the money ran out–the Accademia di Belle Arti in Rome. All along she scared up work: as an instructor in children’s art classes, in addition to her fashion illustration and magazine projects. In 1954 Evaline Ness illustrated her first children’s book— The Story of Ophelia by Mary Gibbons. From then on she stuck with children's publishing, adding to the ironic roster of childless women whose best hope of sustained work turned out to be cranking out illustrated entertainments for other people's offspring. When Evaline died in 1986, she had been living in Palm Beach, Florida. Her Wikipedia biography supplies the detail–courtesy of Eliot Ness biographer Douglas Perry (2014)–that Evaline's "alienated" third husband Arnold Bayard had her cremated and "her ashes unceremoniously disposed of." Evaline Ness papers and manuscripts may be found at the universities of Minnesota and Southern Mississippi, as well as at the Free Library of Philadelphia. Her (abbreviated) New York Times obituary is available here. Evaline Ness, illustration from Favorite Fairy Tales Told in Italy. Written by Virginia Haviland. Published by Little, Brown and Company, 1965. Photo credit unavailable. An elegant-looking Evaline Ness in her studio, published in American Artist, January 1956. She designed the tapestry behind her. Adrienne P., A blogger at the Free Library of Philadelphia, where I first encountered this image, has (sensibly) argued that "Cate Blanchett should play her in the movie." Evaline Ness, illustration from Thistle and Thyme: Tales and Legends from Scotland. Written by Nic Leodhas. 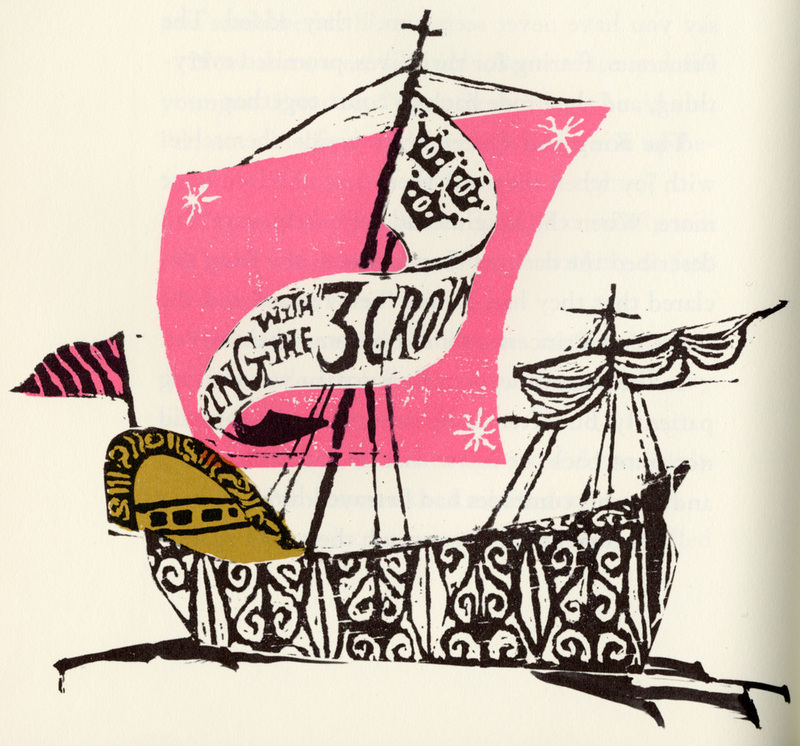 Published by Holt, Rinehart and Winston in 1962. Evaline Ness, illustration from Thistle and Thyme: Tales and Legends from Scotland. Evaline Ness, spread from Favorite Fairy Tales Told in Italy. Written by Virginia Haviland. Published by Little, Brown and Company, 1965. Evaline Ness, cover illustration for Sam, Bangs & Moonshine. After three consecutive years of runner-up-dom, earning Caldecott Honor status (1963-1965), Ness won the Caldecott Prize with this book in 1966. Published by Holt, Rinehart and Winston, 1966. Evaline Ness, cover illustration for Sam, Bangs & Moonshine. Evaline Ness, "One Lucky Girl Was Claiming Bill's Attention". Unknown Publication. Evaline Ness, "She Sat There Without Any Idea What to Say". Unknown Publication.